I love when our leaders solicit us for our opinions! It helps ensure that they are fully informed when they completely ignore them as they make decisions that effect us. However, who doesn't like a survey? I filled it out anywho. The City of Santa Cruz Arts Commission invites you to participate in a community-wide survey, and to spread the word to your audience. You can help determine what the ARTS will be like in Santa Cruz, 5 or 10 years from now. The City Council has approved the development of an Arts Master Plan, in recognition of the contributions the arts make to our city's quality of life and economic vitality. The Arts Commission has just released this Arts Master Plan Community Survey to ensure that the proposed plan reflects community opinions. We invite you to complete this survey and share it with others. Art is a process of discovery. It is a window into the magic and mysterious world of the creativity of the human mind. It helps open us up to possibilities and allow us access to other perspectives. It connects us with others, and for those engaged in making it, the cathartic process of making art can be life-changing. Santa Cruz has has changed my life in a lot of ways, but nothing has been as influential and mind altering than the art experiences I've had here. However, it is a depressing state of affairs that in the last 20 years I've been here, I've seen the number, quality, and variety of independent artists here decline. I hope this survey indicates that Santa Cruz is taking the problems of artists seriously, but until I see otherwise, I wonder if it isn't perceived as merely a marketing problem. This problem isn't about better marketing of the arts. One cannot market what one does not have. 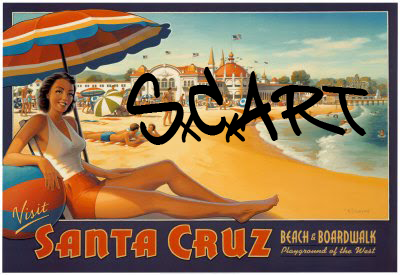 Simply put, Santa Cruz is currently NOT an arts destination. Rather than art hospitable, Santa Cruz is art hostile. High rents, aggressive laws thwarting street performance, aggressive noise ordinances, limits on where one can stand, sit, and perform, decreasing numbers of independent artists, and increasing numbers of high-end art boutiques will be the death of art in this town. Constructive suggestions? Just to start. What would be helpful would be informational kiosks where anyone could post art-related information. What would be helpful would be loosening the stranglehold on downtown aesthetics to include murals, street art, stencil, guerrilla performance, and public sculpture. What would be helpful would be rent-control for artists or low-end galleries. What would be helpful would be a rollback of all of the repressive laws that make life downtown uncomfortable for anyone except those shoppers with fat wallets. I'm hoping the city begins to view art as a creative tool to solving other problems as well. For instance, the city clearly believes there is a serious homeless problem, and solutions are currently limited to pushing them to the fringes. While there are 160 beds for the 1500 to 2000 homeless in town, are there any programs offering art skills and practice to the poor and homeless people in town? Is there support for art and artists' tool co-ops for poor artists who do not have the wherewithal to own their own tools and facilities? The survey is asking some of the right questions. Consider that innovation comes from small efforts. Small-size performance spaces and outdoor spaces. Rehearsal spaces, community gardens with small stages, places to paint, places to play music, quiet places to write, places to practice. Places tucked away and places in plain view. Art has to be woven and integrated with life to make it relevant and important. Closing Pacific Avenue to cars from one end to the other would be a great start. Support people doing things themselves, support self-organization, such as art co-ops , community performance groups, and writer's groups. well-funded venues are less important than connections between people and collaborative efforts. Anything the city can do to support the arts and artists is great. I'd love to live in a town awash in art and artists. However, what we don't need is more centralized art administration, unified marketing efforts, art districts, and official festivals and art events. The words "official," "public," and "qualified" are always the death of art. Rather than the city "fostering," "providing," "offering," and "organizing," how about the city do what it can to support artists self-organizing, providing for themselves, and fostering their own collaborations. How about the city start by not standing smack in the way of art. Hi Wes - I'm happy the survey is spurring this kind of creative outflow. That is the highest purpose it can possibly serve. Since I am not an old-time Santa Cruzan I am perhaps more optimistic than you are about what the city might be able to do. In this case "the city" is comprised of about a dozen of us who are volunteering our time to try and positively influence the "real" city through changes in the local government's policy. We are not elected officials nor are we the faceless bureaucrats everyone loves to blame. We are a group of Santa Cruzans who have been working for months on this, researching, reading, speaking and listening to groups, interviewing individuals, trying to pull as much information as possible out of our community so that we can start strategizing from an informed place. The survey is one of the tools we're using, and we very painstakingly designed it ourselves. Many of your suggestions echo what we are hearing from every quarter; better methods for informing others about art, more opportunities to come together, collaborate, meet and mingle. This being a free market and all, I know you know that city government can't regulate the rental rates of private property. It would take a majority vote of residents to institute rent control in Santa Cruz.The city does require a percentage of each housing project built in the city to include affordable housing units, and as you know, all the Tannery housing will be specifically for artists who meet the low-income criteria. Construction of that project begins 9/16. Trying to bring change to an unwieldy entity such as a local government takes an incredible amount of patience and persistence, as I'm sure you're aware. Nothing is as simple as it may seem because communities are comprised of so very many constituencies. One can do their own art or their own organizing in their own way, as you have done, or one can try to take apart and improve policies that affect the city more broadly. Those of us working on the master plan are in the latter category, at least for as long as we can muster the time and the patience to stick with it. That's what this is about, just so you know. Like you, we are people working in our own way to try and create a more creative and artistically stable place to live. We are trying to first discover and then inform "the city" of how to make that happen, to create a compelling enough case so that the elected decision-makers are inspired to act on our recommendations. They gave us staff time and a little money to help us do it, and I think that's encouraging. I get the problem with policies that are restrictive - we're working on that. So what could the city do to help artists 'self-organize and provide for themselves,' and what do you mean when you say the city should help artists 'foster their own collaborations'? I would appreciate any specific ideas you might have for action steps, i.e. what would be your definition of 'support' when you say the city should "support people doing things for themselves." We are looking for things we can suggest the city do - we need to know what those things are. Linda, thank you for your thoughtful answer. It makes me feel great to know that you and like-minded people are working on the project. I was glad working on the Cultural Council panel to have gotten the chance to work with you and the other folks. Would you be willing to add your comments to my article on the Art Conspiracy site? The survey is very good. You and the rest of the commission should be proud. You were asking questions already that I do not hear asked in Santa Cruz. In fact, the impression I get is that the council would very much like to see us be a good bit more like Carmel By The Sea or Los Gatos. I'm glad to know that other quarters are weighing in with similar concerns and suggestions. I want to weigh in because I hope to remind folks in that later category, forks trying to alter the policies that affect the city more broadly, that institutional change need not ignore do-it-yourself, self-organized projects. Enabling DIY projects in whatever way possible can be an easy (and cheap!) way to plug into the creativity that a lot of people have. Consider it the opposite (maybe the antidote) to what we observed on the cultural council panel: The groups who were the most together, more solidly institutional, who wrote the best grant aps got the money. The groups who needed it the most might not have had the wherewithal to even get a grant ap together. Or they might not have the governance structure or 501(c) status required of most grants. With DIY efforts the money invested is so minimal, people investing in art with money or time can afford to take chances. One of the most impressive and inspiring projects I have ever been a part of in Santa Cruz was the very low-rent (literally!) art space What Is Art? It was in the space on North Pacific where River and Pacific come together. It was torn down for the current project, but sat as an empty lot of ten years. It was collectively run and had performance from a very wide range of talents and abilities. Spoken word, theater, dance, music, open mics, visual art. The connections I made through What Is Art? still resonate in Santa Cruz today. It is with a few of my co-collaborators that we started Guerilla Drive-In, Free Skool, and the Santa Cruz Art Conspiracy. I say this just to illustrate how important these unmediated opportunities to work with other artists can be. I can't imagine anyone I've spoken to from the city would want SC to be anything like Carmel or Los Gatos. That's just gross. We may all have different ideas about what a healthy arts community looks like, granted, but the specter of turning SC into one of those places is too icky to even seriously contemplate. No one I've spoken to has expressed anything remotely like that. Re the Cultural Council grants - the money goes to those who have it together enough to fit the criteria. I guess the way to support individuals or the more informal groups would be to devise a completely different process, because in order to fairly evaluate (assuming you have a finite amount of money to give away and can't give it to everyone who applies) you'd have to start with some mutual understanding as to what constitutes an eligible artist or organization, or have some parameters, even if the parameters are that there are no parameters. Any ideas? I'm happy that there are organizations like the CC out there drumming up money to re-grant to artists and arts organizations, period. Without them these resources would not be flowing to our county or our communities/artists and would be going elsewhere. As for the city and what it can do...I still don't know what you think the city can actually "do." The purpose of any of the institutional change we're working toward is not about the institution itself but to change the way the institution interacts with the groups and individuals who need its approval or support to do what they want to do. So, far from ignoring the diy or self-organized projects, the change we're looking for is in fact about how to accommodate art in all its forms, how to accommodate people who want to bring temporary sculpture or street performance or sidewalk murals or whatever else in the world we can attract to enrich the artistic life of Santa Cruzans. You didn't mention the police but one of the suggestions we're hearing repeatedly is to get the permit process out of the police department. Other suggestions are to create an actual office to deal with cultural affairs (like permits) to help people be successful when they want to have a festival or fair or event. I understand the mentality that things should be allowed to happen without permits or the intervention of the city, but obviously we are a working city with traffic and pedestrians and businesses and liability (people love suing the city) and on and on. Even Black Rock City has organizational strictures and inviolate rules. You want to commune with people by living in a community, you respect that there are different needs and differences among the people you've chosen to commune with. The biggest challenge is to figure out how to enable everybody to do what they want without negatively impacting others. So back to the important question; what is it the city should actually start (or stop) doing? Actions? Programs? Policies? Remember these are elected people with the fiscal responsibility to keep the city solvent and provide all the services everyone expects and pays their taxes for; from water to paved roads to parks to police and fire protection. What can these people DO to help Santa Cruz achieve a more robust and rewarding cultural environment? The term you use, "unmediated," implies (to me) lack of interference or involvement by others outside whatever it is that is going on. So are you saying that the city is unnecessarily trying to control or mediate activities when it doesn't need to or shouldn't? Specific examples? I am serious about needing specifics and suggestions. No purpose is served otherwise. We are trying to get to the bottom of this and start figuring it out in a systemic and honest way, because that's the only way I know of to bring about any meaningful change. I'm not doing this because I want to kill some free time. I believe we can change things for the better through this process or I wouldn't be investing so much time in it. Also just for clarification - although we asked the city for the money to do it and will make the ultimate recommendations to the council as a group, it's not the Arts Commission working on the master plan - the working group is comprised of three of us from the arts commission and staff but includes people from the community and other arts groups, and a very large steering committee that includes artists, arts orgs, business owners, community groups and random individuals who were interested. Share my comments (in context) if you like. Send me specifics! Thanks, Linda. You are right, I didn't mention police, but that is no small consideration. You may not have known, but I was one of the three people profiled and spied on when we created the Last Night DIY Parade. We found out later that police came armed and out of uniform to our meetings and represented themselves as interested participants. We intentionally didn't seek a permit for the parade, because while the city said later they might wave the permit application fee, the required $1 million insurance bond, money for fire, police, security, were thousands of dollars beyond the ability of our grassroots zero-budget event. Additionally, we've had negative police interactions when we've tried to show free Guerilla Drive-In movies downtown to the community, with the police misrepresenting the laws around amplified sound and shutting us down. We've had police try to shut us down as we used public space to teach Free Skool classes, set up a coffee cart to give away free coffee, and knit in public. All of these activities ran afoul of some law or another that prohibited sitting, loitering, furniture, etc. There is a fellow I met recently, a funny and innovative street performer who calls himself Mr. TV. He has an empty TV and does a sort of puppet show that amounts to a send up of TV culture. He also happens to be homeless and so the police have targeted him. Last I heard, he was arrested while performing for passing around the hat and asking for donations. Officers said he could have the equivalent of an open guitar case, but couldn't pass around a hat and ask for money. So yes, the police, and by extension, the city create the impression that Santa Cruz is hostile to art. And in 20 years, I've seen more than a dozen small independent art galleries come and go. I think an art gallery is a tough business that I wouldn't wish on an enemy, but still it is hard to see art struggle so. In another town, the city might go out of their way to make it possible for a business owner to bring music and performance and art to the community. 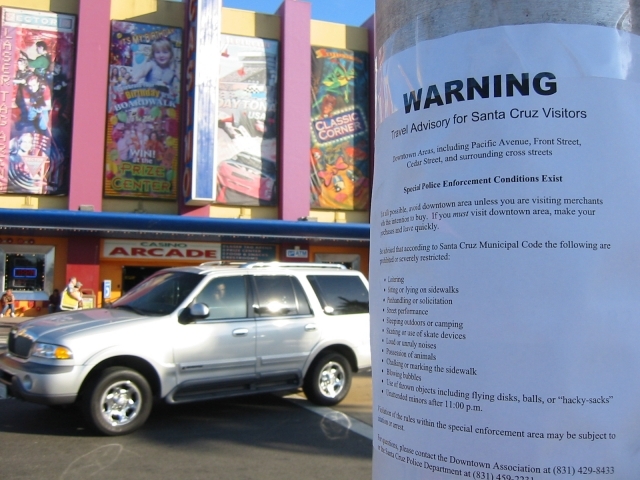 But in Santa Cruz, the hurdles are set so high, permits so expensive and laborious, rules so restrictive and constraining, that numerous businesses and organizations have called it quits instead. I understand the city's desire to control events and issue permits, but it would be super swell if that process was coupled with broad-mindedness and a desire to see art pervade our community. So back to the question, what can the city do (or stop doing) to support the arts? Lemme see, specifics. Mind if I just brainstorm here? * Create spaces in public parks and plazas to support performances and art, including lots of seating and places that encourage people to stop and sit a spell, examples include clock tower park, San Lorenzo Park, the entire levee, the space tucked away by Rhythm Fusion, city-owned community gardens all over town, the municipal wharf, the park along Bay Street, and on and on. * Remove penalties for businesses that choose to allow street art. In many cities what is called criminal in Santa Cruz is lauded as beautiful street art. And that's just a start, right off the top of my head.